At the Chair for Computational Analysis for Technical Systems (CATS) at the RWTH Aachen University, a part of the group is working within the Priority Program 1273 “Colloidal Process Engineering” of the German Research Foundation (DFG). Within this framework, the break-up and restructuring behavior of colloids in Stokes flow environments is being investigated. 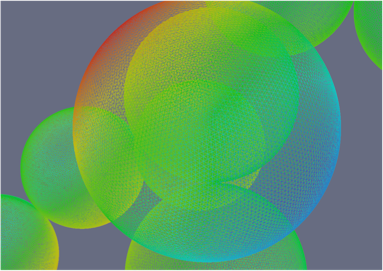 These colloids contain between two and tens of thousands of particles, depending on the level of detail: on the one hand, experiments are primarily focused on macroscopic properties, where the complete system of fluid and colloids is investigated for large numbers of colloids, and on the other hand, in the computational fluid dynamics (CFD) simulations performed at CATS, the microscopic properties of the fluid-particle interaction are investigated. For the simulations, meshes are generated from the data provided by the well-established algorithms for the generation of diffusion-limited and reaction-limited particle aggregation mechanisms (DLA and RLA). These input data are given as text files containing the particle positions and sizes for the mesh generation. 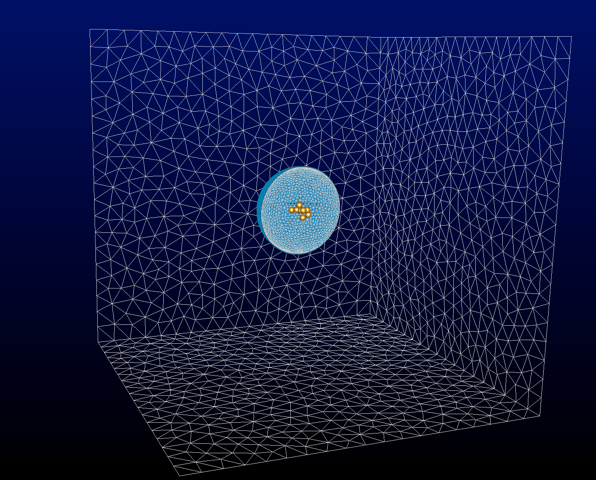 The mesh is generated using a Glyph script in Pointwise that reads the particle positions and sizes and inserts spherical objects into the flow domain accordingly. This way, no CAD program is needed and the generation of the complete geometry can be handled using Pointwise. Once the surface resolution is determined, the mesh generation can be started from the surfaces of the particles. A usual particle is discretized with 10k surface triangles (Figure 1). Using a slow boundary decay for the volume element size, a decent resolution of the boundary layers in the Stokes flow field can be achieved. Figure 1: Surface mesh of the primary particles in a colloidal aggregate. The colors represent the pressure distribution on the aggregate's surface from the surrounding flow field. In a simulation, the aggregates are allowed to rotate and move freely. The translational motion is absorbed in the space-time formulation of the finite element solver XNS (in-house code), while the rotational motion is taken care of using a special layer surrounding the aggregate; a so-called shear layer. It allows for the rotation of the inner spherical block of the domain that contains the aggregate, while the outer part may stay fixed. The layer itself is sheared in this process, and a Delaunay re-meshing algorithm in the flow solver provides a valid shear layer mesh at all times. The scheme is depicted in Figure 2. Figure 2: Scheme for the mesh update: region 1 stays fixed, region 2 rotates, and region 3 is updated in the course of the simulation. In Pointwise, the proper geometry is provided by inserting a special layer of elements in region 3. In Pointwise, this layer can be inserted in the same manner with which the colloid particles are inserted: two concentric spherical objects are generated centered at the center of mass of the colloidal aggregate. Special care has to be taken concerning the width of this layer: for the re-meshing to work, the layer width should be smaller than the local mesh size. With a given boundary decay of the mesh size as well as a given distance of the layer to the aggregate, the local mesh size can easily be estimated. In Figure 3, the complete geometry is shown for a typical Pointwise mesh. Figure 3: Mesh surfaces in a typical simulation: the flow container is a rectangular box, the aggregate is centered in the box, and the shear layer is inserted cocentrically to the aggregate's center of mass. With this preparation, simulations can be performed for the complete fluid-structure interaction of the colloids and the solvent. Drag and torque values can be extracted for the primary particles of the aggregate, and this data can be used to estimate the forces and torques acting on the inter-particle bonds. The current research is concerned with finding an adequate model that allows these findings to be scaled on the microscopic scale to macroscopic properties of the systems that can be investigated by experiments.